It’s been a rather quiet week here at Missouri Star – not a lot of blogworthy happenings. Now that the excitement of sewing week and California car trip is over, it seems we settle down into just "life" and await the next flurry of activity in September when we travel to Orlando for the new arrival. I’ve been inducted into the Honor Society – complete with honors cord to wear at graduation! This certainly helps compensate for all the eyeball bleeding activities that have gone on. I also reserved rooms for graduation weekend. I’ve heard that if you want the best spots you need to reserve a year in advance. And I got a doozy – The Churchyard Inn. It should prove to be a fun weekend. My brother-in-law is a professor at WSU and he and his wife are going to throw a party for us. After 10 years of hard work, I think a little celebration is in order! Yesterday I went up to Bellingham to the Bernina store to teach a class. To my dismay, no one showed up! I don’t think the store owner advertised it very well. I had called her the week before to see how many students were enrolled and she had no idea! I suggested she cancel the class, but she wanted to forge ahead. So, I taught the class to her and one employee and got paid anyway. I used my fee and the teacher discount to buy lots and lots of thread. I think I’m all set with thread for awhile and now need to stop buying and start sewing! And if I’m going to do that I need to do it now – beginning the end of June and going through most of July I will be working 5 days a week (instead of 4). I’m not really looking forward to that. I do love my Fridays off. But it will give me the opportunity to sock some money away – maybe for a new computer. I have an Apple discount as long as I’m in school and might look at upgrading my Mac before I graduate. So there you have it – pretty boring news. If you’ve made it this far – thanks for sticking with me. I’ll try to have more excitement next week, but no promises! These were started quite a while ago and had been sadly neglected. As you can see, they are fraternal twins. I would have preferred identical, but the color runs on the Austermann are so long, it just wasn’t possible. The obsessive side of me is dealing with this. The pattern is just a generic top down, flap heel and picot edge. This is the second pair I’ve made with the picot edge. I had originally thought that socks with this type of edge might not stay up well, but they work great and I love the look. There will definitely be more in my future. This is some Opal that has been hanging out in my stash for next to forever. In fact, I think it was probably one of the first sock yarns I ever bought. The pattern is again the good old generic top down with flap heel. I have to admit that I started a picot edge on these. I use the waste yarn method and usually use cotton because it’s easy to zip out. I didn’t have any with me so used a scrap of wool. When zipping it hung up on itself and I used the scissors to snip it. However, I snipped rather more vigorously than intended and cut my sock yarn too. I didn’t feel like starting over so just recast on with ribbing. Also started on the trip was another CIC sweater – I’ll post pictures of that later. I did work one day last week and paid the price for having two weeks off. I went to the post office to pick up our accumulated mail and let’s just say that I’m still diving through all of it. On Monday the doctor comes back and I have to inform him of our latest staffing nightmare. Let the games begin (again). But enough of this stuff – I have some projects that have deadlines and I really need to get working on those. So this afternoon I will begin working on a knitted sheep. I’ll either love it or be tearing my hair out by the end of the weekend. Stay tuned for the next chapter. And Happy Mother’s Day to all you Moms out there. I’m spending the day relaxing and enjoying a great meal cooked by hubby – barbequed ribs, potatoes and fresh green beans with almonds – Yum! Yesterday Kristen said she felt like adding "and a partridge in a pear tree" to our list of FO’s. How funny! The one Christmas ornament I finished WAS a partridge in a pear tree! Kristen, this one’s for you! Please forgive the less than stellar photo. It’s the best I can do pre-coffee and with the beginnings of a migraine. Continuing on with our vacation saga – on Thursday my friend dropped me off in Marysville, where I met up with hubby for our trip to California. First, a little background: If you’ve been following my blog at all, you know that hubby is a great lover of little cars – especially old little cars. He started out with a 1958 Isetta, then a 1973 Mini Cooper. Several months ago he saw a 1930 American Austin for sale on Ebay. I had to wipe the drool off his keyboard! There was no question about bidding on it – we just didn’t have that kind of money. But he watched eagerly. The car didn’t sell because the reserve wasn’t met. 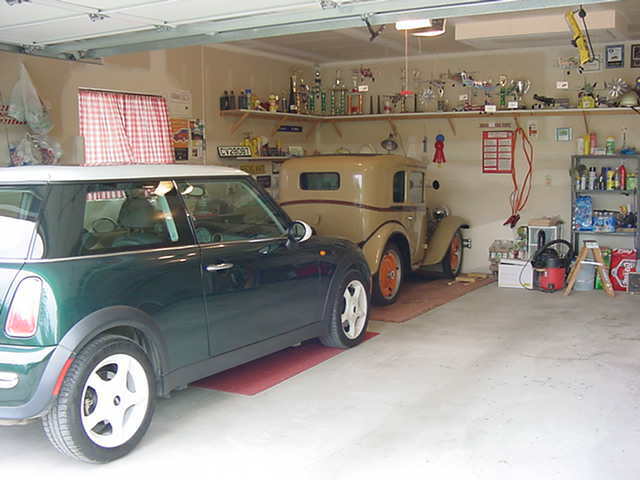 So, on a whim, hubby emailed the owner and asked if he would be interested in a trade – our Mini Cooper for his Austin. Turns out the guy has always wanted a Mini and after about a month of negotiations, a deal was made. He was traveling out from Michigan to San Francisco and would bring the car with him and meet us in California. This was a very good trade for us because the Austin is worth more than the Mini, but in talking with the owner later, he said hubby’s love for the car really shone through and it was never about money. He just wanted the car to go to someone who would love it and not turn it into a hot rod, but keep it original. Our trip down was pretty uneventful, although we ran into snow in the Siskiyous – it’s May for cryin’ out loud! So there you have the saga of "What I Did on My Spring Vacation." Of course, as seems all too common in life, I came home to more stress. While I was gone, one of our employees quit, without notice. So I come home to staffing issues, which along with parents and insurance, seem to be the bane of my existence lately. I’m glad I’m rested up! Oh, almost forgot – after all, this IS a knitting blog, although you’d hardly know it lately. Knitting was accomplished on the road trip. I promise pictures and a full account of that next posting. One of the nicest things about being away is returning home. My namesake is right – there is no place like home! We had a wonderful time away with lots of projects accomplished and a safe and productive trip to California. Believe me, this was the neatest that table was for the entire week! Within a short time we had piles of fabric and projects everywhere and the most frequent comment was, "Have you seen (insert scissors, pattern, fabric, thread, etc. here)?" But what fun to just sew and sew with no deadlines, no ringing telephones, no toilets to clean or laundry to do (other than prewashing fabric that we bought!). Did I mention that there were three quilt shops within easy driving distance? We had brought some definite plans for projects with us, but we also let the spirit lead us and threw in some spur of the moment projects too. We even had time to go to a Quilt Soiree at the closest shop and met (can you believe it???) some quilters from right here in Oak Harbor! They were staying at the same condo as we were and had won their trip at our local Christian School auction – yes, the same one that my friend and I had made the quilt for. What small world! The final tally? Between the two of us we completed 3 dresses for granddaughters, one tablecloth, 6 sets of napkins, one jacket for Izzy, one quilt top, 3 blocks for Quilts of Valor (for wounded soldiers), 2 blocks for the Quilt Soiree, one potholder, 4 embroidered Hummel pillow tops, 2 embroidered blocks for a Snoopy quilt, one Christmas ornament and 2 embroideries for purses. In addition, we were able to complete the preliminary digitizing for the logos for my work and for my husband’s car club. Whew! And I also love my four Hummel pillow tops. I had only meant to make one or two, but I couldn’t stop myself. Do you notice a little girl theme here? As much fun as we had, by the end of the week we were both ready to come home, but my adventure was just beginning. Tomorrow – the trip to California and pictures of the new addition to the family.